What is glucose tolerance test all about? How can I read and interpret the results? Which of them should make me worry? It is alright to have such worries. I will try to give the right answers, those you strongly need in the following paragraphs. Now, first of all you must understand why this test is also called blood sugar tolerance test or just glucose tolerance test. It's a test you perform to get to know how your body breaks down your blood sugar (glucose) and assimilates it. How can you read and interpret the results? The fasting blood glucose level 70 to 100 mg/dl, meanwhile your blood sugar level after two hours should be less than 140 mg/dl. If your blood glucose level would be between 140 and 200 mg/dl, then you may have pre-diabetes ( or impaired blood glucose level). If you come out with results more than 200 mg/dl, then you may consider the possibility to have diabetes. But to confirm this, you must repeat the test. On the other hand, high levels of blood glucose may derive from other health problems. For this you must check with your physician. 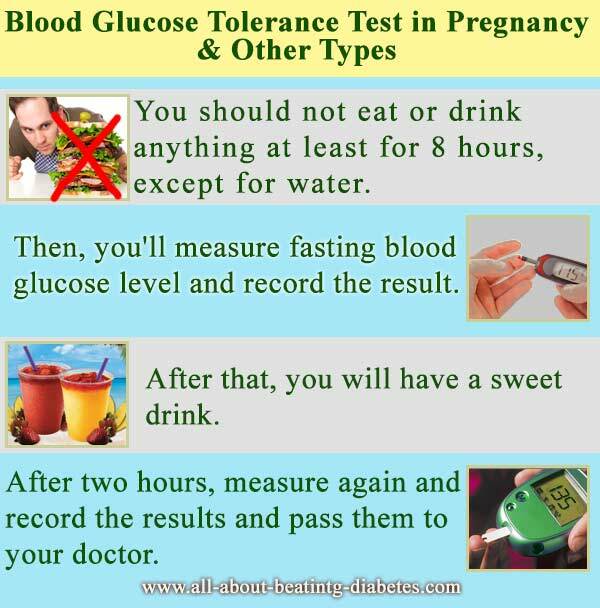 The chart below will give you a clearer idea on oral blood glucose tolerance test. You should not eat or drink anything at least for 8 hours, except for water. Then, you'll measure fasting blood glucose level and record the result. After that, you will have a sweet drink. Usually, it is required to have a glass of water with added 75 - 100 grams of table sugar. Sometimes,having other drinks with the same quantity of sugar is required. After two hours, your blood sugar level will be measured again and the results will be recorded and passed to your doctor. Actually, the range less than 180 mg/dl will be considered as acceptable blood sugar level for a diabetic. But you must do your best to keep your blood glucose level nearly at a normal range as much as you can.